John le Carré introduced himself as the de facto spy novelist of the Cold War era. His writing, including The Spy Who Came in from the Cold and Tinker Tailor Soldier Spy (both of which were previously featured on this blog), ousted spies as morally ambiguous, traitorous and amorphous. Pop culture had previously been acquainted with only the daring and adventurous detectives in Dashiell Hammett's work and Ian Fleming's high society spy James Bond. Le Carré introduced spying as the ultimate dirty work, where neither side ends up better off. In his work, good men and bad men were equally likely to be found on both sides of the Berlin wall. The Cold War ended but espionage and intrigue didn't. 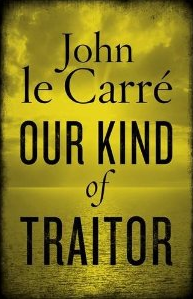 Le Carré's work has always been rooted in modern fears and fabrications and so it is with Our Kind of Traitor. A Russian oligarch knows that his end is near and begs two Brits to arrange a new identity for him and his family - his information on the Russian mob in exchange for asylum. The Brits, Perry and Gail, play along uneasily at first, but are drawn into a standoff between Dima, the Russian, and the British Secret Service. Perry and Gail are fooled by their own vanity and end up getting a raw deal. The British Secret Service on the other hand is highly dysfunctional and has fractured into rival groups with conflicting agendas. Despite an ending that felt too familiar from The Spy Who Came in from the Cold, Our Kind of Traitor is a riveting read. It is a perfectly well crafted spy thriller and I am happy to report that physical violence is kept to a bare minimum. This is not a superhero movie, nor a spy novel disguised as one. The characters, especially those of Hector, the spy master, and Perry, the Oxford lecturer turned envoy, are memorable and robust. Men especially will feel tinges of discomfort when reading about Perry's competitive desires and inability to back down. Le Carré, as always, is the master of international espionage. Other writers put their weight on creating action and suspense through harrowing escapes, car chases and shootouts. Le Carré has instead perfected the slow build-up. Never have I felt so intimidated by a lone Swiss police officer at a train station in Interlaken, or a suave international businessman with an Italian sounding name, who is always nearby when trafficking and money laundering are discussed. Of course, it is all just as fictitious as the shooting and the racing, but for me this is what spies are really about: cold sweat on your back, neglected loved ones or friends and a pervasive uneasiness with the world around us.